Please be sure to follow the instructions on this certificate if you would like to take advantage of this exclusive offer. 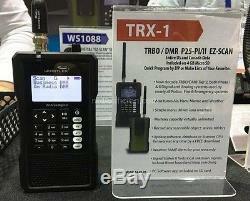 NEW Whistler TRX-1 Handheld Digital Scanner. P25 & DMR & Motorola TRBO. It is a multi-system adaptive Digital tracking trunking scanner with Motorola P25 Phase I, X2-TDMA and Phase II capabilities. All USA/Canada frequencies are pre-programmed onto the included SD card making it ready to use out of the box. This model features an easy to use navigation with a multifunction keypad and includes a PC program for easy customization and includes USB cable and PC software. It also has Virtual Scanner mode that can store 200 various scanner configurations. The TRX-1 permits recording by scannable object and saves into a Windows compatible file. The clock and calendar function adds date/time info to the recordings and has the ability to power the scanner on at a specific time. The dedicated Skywarn/Weather button allows quick access to frequencies used by storm spotter networks and NOAA weather reports. Additionally, this model features Whistlers Spectrum Sweeper and a programmable audio and visual alert system. Scanner comes with a removeable rubber case with two additional interchangeable colored inserts for the back. MULTI-SYSTEM TRUNKING - scans most common analog trunked radio system signaling formats, including APCO P25 Phase I and II, Motorola, EDACS and LTR. Both talkgroup and individual call monitoring are supported. EASY TO USE FULL KEYBOARD - and display with backlit Alphanumeric keypad familiar Scan, Pause, Skip and Navigation controls make it easy to use. NEW OBJECT ORIENTED MENU DRIVEN USER INTERFACE - provides common data entry, browsing, and control methods for every scannable object with support for millions of stored objects, limited only by Micro SD card capacity. EASILY CREATE NEW OBJECTS - and edit existing trunked Systems, Sites, and Talkgroups without connecting to a PC. Free downloads of updated database, CPU and DSP rmware. 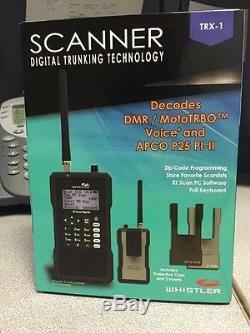 IMPROVED P25 FUNCTIONALITY - detects digital voice audio, and decodes RadioID/TalkgroupID data embedded in voice packets. BUILT-IN DISCRIMINATOR OUTPUT - provides raw discriminator signal to third party signal decoding software without risky hardware modications. UPGRADEABLE CPU FIRMWARE, DSP FIRMWARE AND LIBRARY - keep your radios CPU and DSP rmware and RadioReference library current with enhancements and updates as they become available with free upgrades! MICRO SD CARD - uses an industry standard Micro SD card to store the RadioReference data library and all of your programming - capacity for millions of stored objects! Supports cards up to 32 GB. Entire USA & Canada data included on card. FULL USB INTERFACE - industry standard Composite Device USB interface with USB Mass Storage Device (MSD) and Serial Data (CDC) support. Access the Micro SD card without removing it from the radio, stream decoded Control Channel data and upgrade your radios rmware over USB. POWERFUL PC APPLICATION SOFTWARE INCLUDED - customize existing programming or add new objects to scan, and keep your rmware and Library data up to date. SKYWARN® STORM SPOTTER FUNCTIONALITY - instant access to frequencies used by storm spotter networks. You can monitor storm conditions as they occur, and become aware of dangerous conditions before the media or emergency management ofcials are able to announce them to the general public. SAME AND ALL HAZARDS WEATHER ALERTING - features a Dedicated SAME Weather Alert Receiver mode, alerting you to severe weather and other hazards in the specic area(s) that you select, or, can check your local NOAA weather frequency periodically, even while scanning, and alert you when an All Hazards alert occurs. POWERFUL SPECTRUM SWEEPER - quickly sweeps the frequency ranges for transmissions from nearby sources. When a nearby transmission is found, the scanner automatically tunes to that frequency and receives the trafc. Lockout found frequencies and continue searching the same band. 200 SCANLISTS - provides the unprecedented ability to group your stored objects using up to 200 Scanlists plus a special Skywarn® scanlist. Objects can be mapped to as many Scanlists as desired, giving you complete exibility for grouping objects and selecting groups in any combination for scanning. SCAN SETS - expand the functionality of Scanlists by allowing you to dene different combinations of enabled Scanlists as Scan Sets, then you can select one or more Scan Sets for scanning using a simple menu system. With Scanlists and Scan Sets you have unlimited possibilities for grouping, enabling and disabling objects for scanning. EXPANDED V-SCANNER ll STORAGE SYSTEM - with the expanded V-Scanner II (VS-II) storage system, you can use the PC Application to save up to 200 V-Scanner congurations on the Micro SD Card, which can be recalled at any time in the eld using the radios keypad. AUDIO RECORDING - record received audio from selected objects and searches to the Micro SD card. Replay recorded audio using powerful built-in playback system or transfer to PC for playback and archiving. Record over 50 hours of audio. BUILT-IN CLOCK/CALENDAR - date and time stamp recorded audio les, and alarm clock function allows you to program the scanner to wake up and start scanning at a specic time each day. BUILT-IN SERVICE SEARCHES - provide predened service search ranges make it easy to nd activity in your area. WHISTLERS EXCLUSIVE ALERT LED - programmable tri-color LED displays thousands of colors that can be used to indicate different types of activity or activity on special channels. Program color sequences with multiple colors for special alerts, even emulate the red/blue strobe of police vehicles. PROGRAMMABLE AUDIBLE ALARMS - can be congured to sound when certain objects are active. PROGRAMMABLE BACKLIGHT AND ALERT LED FLASH PATTERNS - The backlight can be programmed to ash with custom ash patterns when certain objects are active, providing another way alerting the operator when important radio trafc is present. SIGNAL STRENGTH METER - Shows relative strength of received signals. 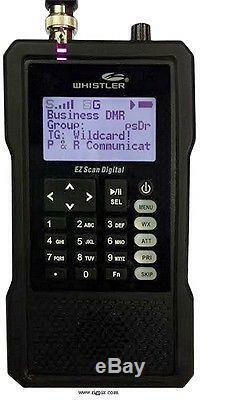 EZ SCAN Digital Scanning Receiver. 900 MHz Band, 23 cm Amateur Band. Case and 2 colored inserts (Green and Grey). System Requirements works only with Windows Operating System. We can work with your Federal, State, County or City agency for your purchasing needs. For all your radio & accy needs! The item "Whistler TRX-1 Handheld P25 Digital Trunking Scanner Radio Self Programming" is in sale since Friday, September 23, 2016. This item is in the category "Consumer Electronics\Radio Communication\Scanners". 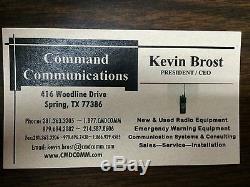 The seller is "commandcommunications" and is located in Spring, Texas.